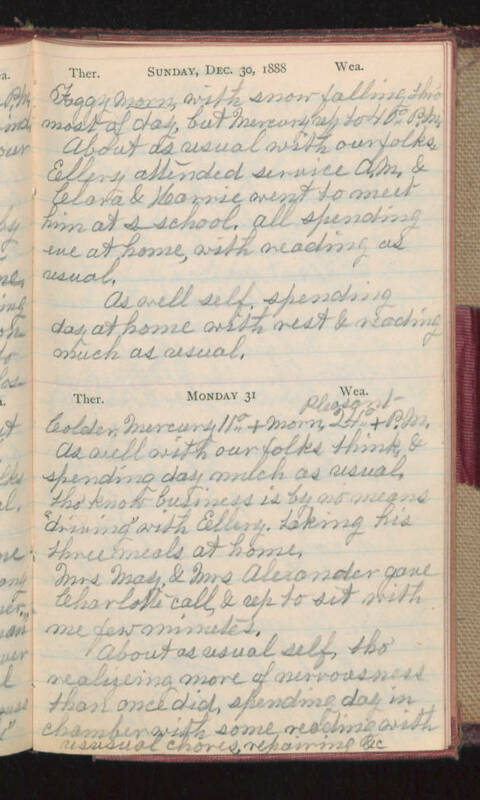 Sunday, Dec. 30, 1888 Foggy Morn, with snow falling thro' most of day, but Mercury up to 40° P.M. About as usual with our folks, Ellery attended service A.M. & Clara & Karrie went to meet him at s-school. All spending eve at home, with reading as usual. As well self, spending day at home with rest & reading much as usual. Monday 31 Colder, Mercury 11°+ morn, 24°+ P.M. pleasant. As well with our folks think, & spending day much as usual, tho' know business is by no means "driving" with Ellery. Taking his three meals at home. Mrs May, & Mrs Alexander gave Charlotte call, & up to sit with me few minutes. About as usual self, tho realizing more of nervousness than once did, spending day in chamber with some reading with usual chores, repairing &c.